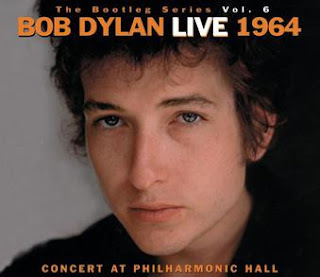 One of my personal favorites in the Bootleg Series is Bob Dylan's Halloween Concert at the Philharmonic Hall. A pivot point in his early career, the show showcases his early songs and suggested what was to come. The concert, performed in two sets, featured songs from his first four albums and new material that would appear on Bringing It All Back Home. On this particular evening he appeared relaxed and good natured before a packed house, joking "I'm wearing my Bob Dylan mask tonight." Dylan began the show with "The Times They Are A-Changin" in an almost jaunty heralding of a new age. Next came the only live version on record of "Spanish Harlem Incident." "Talkin John Birch Paranoid Blues" was a staple of Dylan's early live shows, still a crowd pleaser in 1964 (once again relevant in the current climate). "To Ramona" displayed Dylan's interest in writing daring love songs that were also political. "Who Killed Davey Moore" was another early effort that never appeared on an album, a song about a boxer who tragically died after a fight. The next three songs offered something new, even revolutionary, for the audience. What on earth did they make of "Gates of Eden"? Was it a protest song? Beat inspired poetry? Dark and mysterious lyrics suggested abstract art as folk song. "If You Gotta Go, Go Now (or else you gotta stay all night) could be a Top 40 pop song with its playful lyrics, a possible Beatles parody. And then another showstopper with "It's All Right Ma (I'm Only Bleeding), a terrifying secular sermon that was a different from anything Dylan had written up to that point. The first set closed with more familiar songs. Dylan forgot the lyrics to "I Don't Believe You (She Acts Like We Never Met) and got some help from the audience. "Mr Tambourine Man" and "A Hard Rain's A-Gonna Fall" were performed with precision and passion. After a brief break Dylan began the second set with some familiar favorites. "Talkin' World War III Blues" got a thunderous applause. Then stirring performances of "Don't Think Twice, It's All Right" and "The Lonesome Death of Hattie Carroll." Joan Baez joined Dylan for "Mama, You've Been On My Mind," one of their favorite songs to sing together. Baez took lead vocals on the traditional "Silver Dagger" with Bob on harmonica. "With God On Our Side" was another duet they performed together many times. An exuberant "It Ain't Me Babe" could almost be a dialogue between Baez and Dylan at that particular moment in time. Dylan closed the evening on a light note with "All I Really Want to Do." The Dylan of late 1964 would be vastly different than the Dylan of 1965, the Dylan of 1966. The Philharmonic Hall concert showcases the artist coming into his own, signaling a new direction.